Over the last twelve months there has been substantial activity in respect to the research and development (R&D) tax incentive with various announcements broadcasted by the government and a declaration of a review of the programme. As a result, the discourse of business and government in Australia is rife with mentions to innovation, disruption and dexterity. Last night, the treasury announced the 2016-2017 budget, signifying a major step in making Turnbull’s innovation goals a reality. In light of this, the key aspects of budget have been outlined in the infographic below. Overall, the 2016-17 budgets mostly encompasses policies revealed in last year’s $1.1 billion innovation statement. The budget encompasses a $9.2 billion package of reforms across company tax, small business and personal income tax. The policies include tax incentives for early-stage start up investment, an expansion of the CSIRO’s accelerator program, changes to the employee share scheme and reforms to the equity crowdfunding reforms. Notably, the measures include raising $4.7 billion over four years from tax on tobacco, which will assist in funding further tax cuts for small business and an effective income tax cut for middle Australia. For instance, a key measure outlined in the budget is is lifting the 32.5% tax level threshold to $87,000, up from $80,000, removing 500,000 taxpayers from the 37% second top marginal tax rate. Furthermore, under a 10-year plan the corporate tax rate will be reduced for all companies from 30% to 25%. From 1 July, the small business tax rate will be cut by 1% to 27.5% and the turnover threshold for small businesses able to access a reduced tax rate will be increased to $10 million (currently companies under $2 million tax rate of 28.5%). Whilst the above reflects the interaction between the current legislated rate of R&D tax offset and proposed changes to the corporate tax rate, we anticipate that there may be future proposed reductions to the R&D tax offset rate. This would restore the relative permanent benefit of the R&D tax incentive. Such future changes to the R&D tax incentive may also include recommendations arising from the current review of the programme. 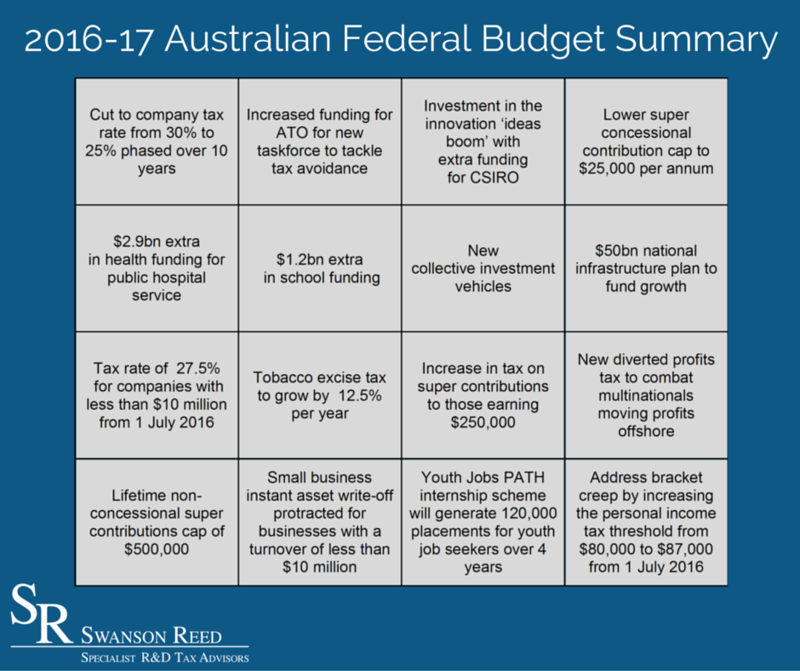 In summary, Swanson Reed applauds the lower company tax rate and the government’s focus on policy initiatives to drive innovation. We call on the government to carefully consider any future proposed changes the R&D tax incentive to ensure that the relative benefit, scope of eligible activities and key eligibility thresholds are not detrimentally changed. The R&D tax incentive remains the cornerstone of Australia’s innovation system and its stability is crucial to attract and maintain business investment in Australian innovation.